If it’s getting to be time for you to switch our your old water heater for a newer model, a hybrid electric water heater might be a great choice for you. These models are incredibly efficient and effective and once you make the switch, you’ll wonder why you waited so long! Learn more about the many benefits of hybrid electric water heaters in today’s blog. Hybrid electric water heaters offer many benefits! Heat your water quickly and efficiently! One of the biggest benefits of hybrid electric water heaters is that they are so efficient, they can greatly cut down on your electric bill each month. In fact, some models use up to 50% less energy than non-hybrid water heaters! This can have a real impact on your monthly bill and keep your money where it belongs: in your pocket. By purchasing an Energy Star rated hybrid electric water heater, you’ll not only save money on your electric bill, but you’ll also have a significant impact on the amount of greenhouse gases your home emits. Hybrid models are much more efficient than gas models and release very little carbon monoxide, making them the perfect choice for any green home. At Master Plumbing and Mechanical, we have extensive experience with supplying and installing hybrid electric water heaters. 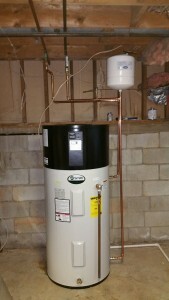 We recently installed new hybrid electric water heaters from AO Smith in a home and the homeowners couldn’t be happier! Our customers love them for the fact that they save money, energy, and time. If you are interested in learning more about hybrid electric water heaters, give the experts and Master Plumbing and Mechanical a call. We can help you decide whether they’ll be right for your home and your water heating needs, and after you’ve made your decision we’ll be there to provide expert installation. This entry was posted on Thursday, February 25th, 2016 at 6:46 pm. Both comments and pings are currently closed.